Behind the Mic—Guest John G. Dooley – Welcome to the 2019 Beemie Awards! The first interview of a series of interviews with some of my fellow racecallers from across the country. Hope you guys enjoy these looks Behind the Mic! 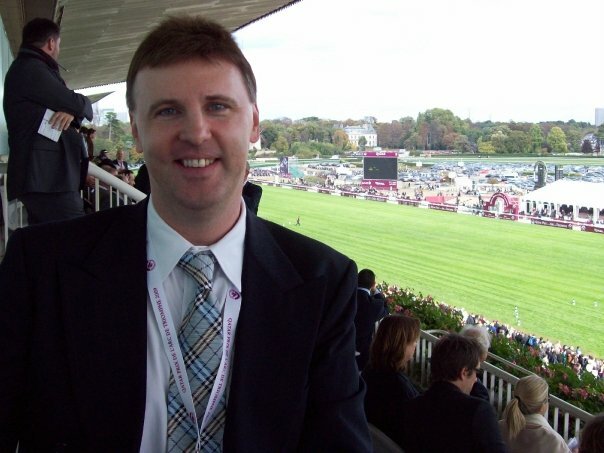 John G. Dooley is the announcer at Arlington Park in Chicago, Illinois as well as at Fair Grounds Race Course in New Orleans. In addition to racecalling John’s a world traveler, loves the other football (soccer), and is one of racings nicest guys. Jason: How did you get into horse racing? Saratoga for the first time. I was just hooked on the atmosphere and excitement of the sport. So I decided when I went to St. John’s University that I’d like to work in the horse racing field. I did want to be an announcer from an early age but worked in Publicity at the NYRA and eventually was able to call my first race at Philadelphia Park (now Parx) in 1989, which was two years after I started full time work in the industry. We all remember our first call, tell me about yours? JGD: It was back on a rainy, kind of foggy day at Philadelphia Park. Keith Jones was there at the time and had taken a few days off. So I got a shot at calling. I was nervous yet confident. I kept telling myself, “You’ve called races into a tape recorder from the roof at Saratoga. This will be a piece of cake.” Of course, the field broke and my hands were shaking some. Got through it. Called the right winner. And the next race was a lot easier. And haven’t looked back. What do you remember about the day you found out you got your first announcing job? JGD: I was lucky enough to have called some races in New York thanks to Marshall Cassidy and Tom Durkin, who joined NYRA in Fall, 1990. It was incredible to even be in the Belmont booth let alone call full cards. But I also wanted to branch out, sprout my wings and cut my teeth a little more. So it was a thrill when Damon Thayer (now Kentucky State Senator) told me Thistledown in Cleveland, Ohio was looking for someone. They raced a lot of days back in 1991, so it was a thrill to think I was about to get paid for something I just loved to do on a roof or at home into a tape recorder! It was an exciting day when the call came at my parents. Some announcers have had to move a lot to pursue their dream, how many times have you had to move? Any nightmare stories from the road? JGD: I’ve been lucky to not have made too many moves. There was from New York to Cleveland, Ohio for my first full time gig so that was a pleasant trip and with a year round position. After that, I did spend some time back in New York before Dallas, Texas to open Lone Star Park in 1997 and to Chicago in 2000 where I have been ever since. Add Fair Grounds to the equation which is my Winter home but love the city, food and atmosphere. I do remember one winter trying to travel back to Texas. It was a blizzard somewhere in Virginia. I had a Toyota 4-runner at the time but it was a white knuckle ride most of the way. That was not fun! Ever had any crazy guests in the booth during a race? JGD: While at Thistledown I was joined once by Oliver “Atomic Bull” McCall, a heavyweight boxer. He actually called a good race. A lot better than anyone imagined. A fun moment in the annals of Cleveland racing history. Do you remember your worst call and what was it? JGD: That could be tomorrow. Or the next day. It’s a humbling job when trying to combine working with your brain and what comes out of your mouth at the same time for all of the World to hear in around 2 minutes time. But I do remember mixing up two horses (with similar black colors) at Arlington many seasons ago. I didn’t realize it until it was too late. I wanted to the punch the wall. It was pretty upsetting. Now, I would just shake it off and go on to the next. But I’ve mellowed *a bit) with age! JGD: Everything. It’s so satisfying to see these equine athletes compete and race at such a peak performance level. I just love the morning, walking to the announcer booth and knowing when I was 16 this is where I wanted to be. And here I am. I also appreciate anytime a horseman says to me, “Great job.” Or “Great call.” I respect all those people on the backside of every track that put in such tireless hours. I salute them for having these wonderful horses ready for us to call each day. And race for the fans and players. 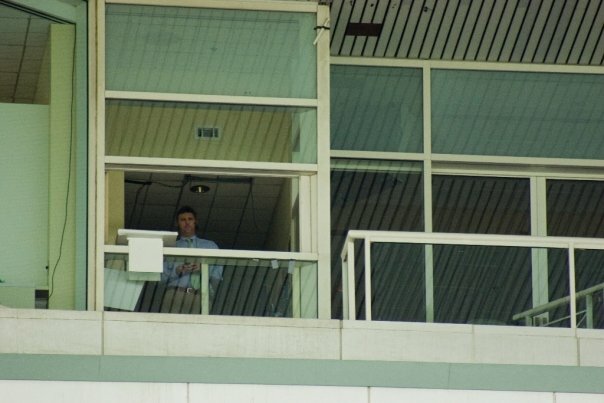 JGD: At Arlington, you need to open windows to call the races. It has made for some very warm and humid Chicago summer days in there. So it’s not very big and left by some ways from the finish. Next to me the more spacious Stewards and Placing Judges, so that’s my angle. Plus, we are build way into the stands so the turf course (Lane 1) finish always seems real far away. 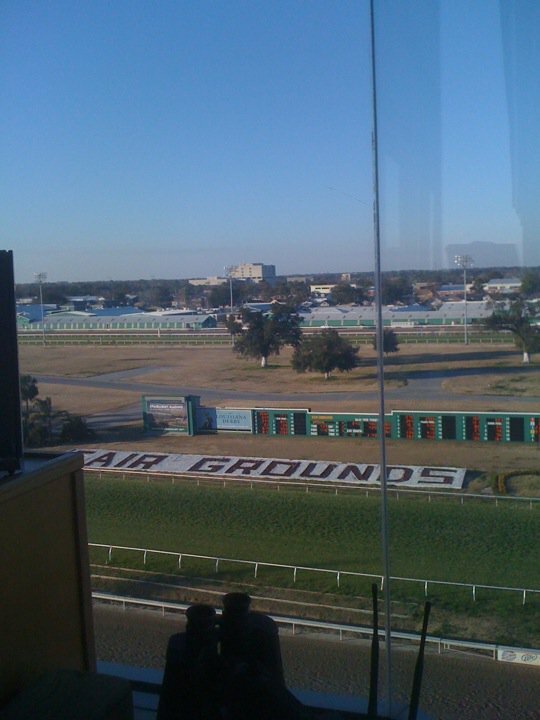 While Fair Grounds, it’s built atop the race course, but an all glass booth. I miss opening a window to get some of the flavor of the crowd and thrive off them but it’s just left of the finish with Placing next door, so it’s nearer the line than Arlington. Of course, at both tracks for me there are trees to contend with but it adds to the charm. And stress (when they go in back of the Petite Bois). Most of us are bettors, what’s been your best or most memorable score? JGD: It had to be at Thistledown one day years ago. I was alive in a double to a horse that Omar Londono was riding as I recall. It was paying around $750.00. Had nailed a long shot in the first half. A small field turning for home and I thought he might have drifted in. But during the call, I somehow stopped what I thought I just saw (drifting in on a foe slightly) from coming out of my mouth. So much for objectivity. In this very, very rare case! Of course, the Stewards don’t usually have the TV volume turned up either way. My horse came home first but I had to sweat out an Inquiry. I remember one of the Stewards at the time calling me after they crossed past the finish. He said, “John, we’re going to have an Inquiry.” My reaction? Oh really? Where?” They looked at it and the resulting “insufficient evidence of any foul” call came in, much to my delight. Every announcer i’ve ever talked to seems to have a memory of Luke Kruytbosch, what is your favorite one? JGD: When I first accepted the position of announcer in Chicago, I had hopes of calling at all three of the area tracks (Arlington, Sportsman’s Park (at the time) and the other one. After some debate, Hawthorne went in a different direction. I was very disappointed at the time. But also, without any place to call from late September until following March. Well, Luke called from Turf Paradise, as he has too many others, and asked if I had interest in doing some fill in for him in the Valley. I didn’t hesitate to say “Yes.” Had to the chance to spend some time with him ordering some great grilled wings and beers at Padre Murphy’s and share racing stories and laughs. A fun guy. A great race caller. And sorely missed. Especially my millions on the first Saturday in May. JGD: Soon I will be doing calling the Wiener Dogs here in New Orleans in 2014. I have also called my share of ostrich and camels too. Plus we have a Mascot Race at Arlington so sometimes a caller’s duties aren’t limited to thoroughbreds. I did get to have a voice over roll in the HBO series Treme and while in Cleveland did a voice over for the Shell Race Game which aired between innings at Jacob’s Field (at the time in 1995). They had a great team back when I was there and the city saw a huge surge in fan interest, so that was actually cool to be a part of even though it wasn’t horse racing related per say. If in 2014, you had a “Call any race you want” card, which race would you cash it in to announce? JGD: The Belmont Stakes. Whether there was a Triple Crown on the line or not. I worked a few of them while I was in the Press Office and it’s just an amazing day to be in a New York State of Mind! Ok, I’m in Chicago and the races are over, where do I go for good pizza? JGD: I do love New York style pizza (just fold the slice – no knife and fork, please). In Chicago though, I really do enjoy Lou Malnati’s deep dish the most. Especially since, it was sad, they closed Gino’s East that was closest to me. So Lou’s it is!